In order to provide clean and stable electricity to the industries in Taiwan, the government has constructed three nuclear power plants from 1971 to 1978. Over the serving years, The spent fuel was storage in the spent fuel pool. After certain period of cooling, the spent fuel will be transferred to the dry storage facilities for interim storage. During the transportation of the spent fuel, all details of the facilities and procedure needs to be emphasized. It is obvious a challenging task, which bring SmartDO and ANSYS to the picture for advanced engineering design. When the spent fuel is retrieved from the cooling pool, it needs to be sealed inside the Transportable Storage Canister (TSC), which is contained in the Transfer Cask (TFR). Above the TFR, two heavy duty hooks are responsible for carrying all the loading during transportation of the TFR. The TFR, the struts that protects it from earthquake incident, and the hooks that carries all the weight. Due to the limited operating space inside the power plant, certain cranes are not possible to operate inside. This raises another issue : the total weight of the TFR and the hooks should be as light as possible, to ensure not only the cost down but also the safety of the operation. In the same time of reducing the weight, the hooks shall be at least as strong as the original design, or even stronger. Further more, the envelop of the hooks must be confined in a limited space to ensure the smoothness of the transportation. This obviously requires a absolutely optimal design to achieve the goal. The defined geometry of the hooks. The new design should be be confined in a specific envelop. 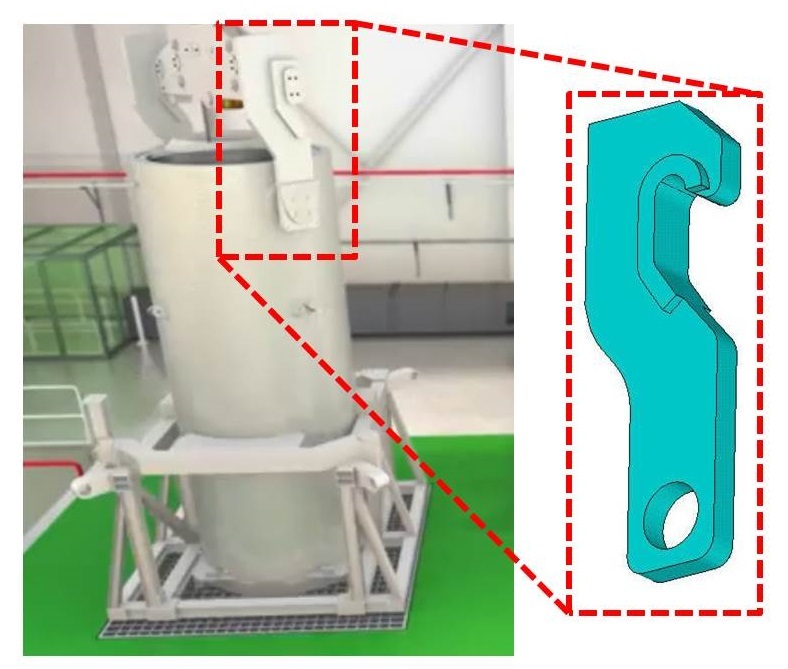 In order to accurately predict the structural behavior of the hook, ANSYS was used to analyze it according to regulation. The calculation results were used as the baseline of the original design. 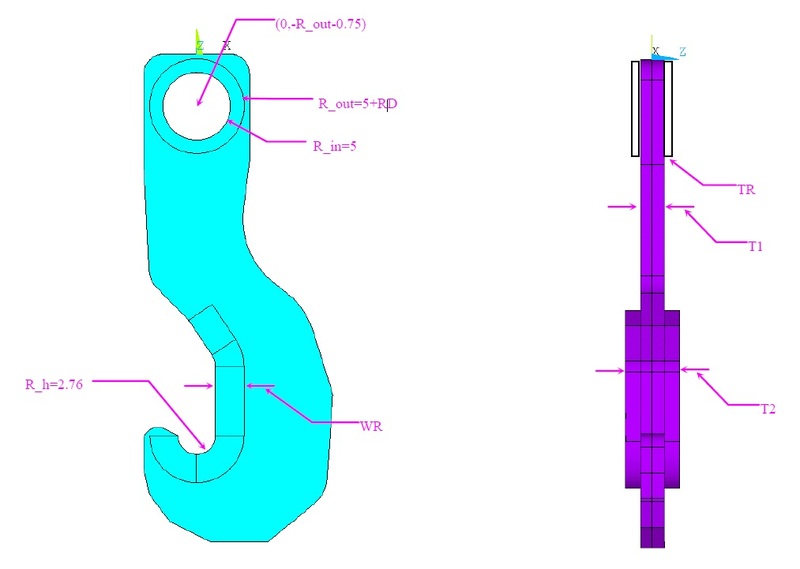 After the structural response was well understood, much resource was contributed into the re-design of the hook without significant improvement. 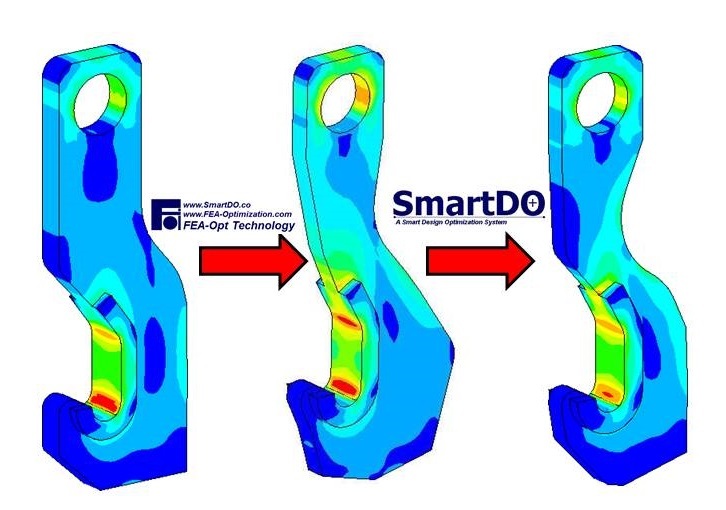 Then SmartDO was invoked to coupled with ANSYS to perform design optimization. The weight must be minimize as much as possible. The hooks shall be at least as strong as the original design, or even stronger. The envelop of the hooks must be confined in a limited space. The model was set up with SmartDO and ANSYS, and the design optimization was launch without parametric study and/or statistically investigation. SmartDO was started to run the optimization before the and of the day, and it gave an solution the second day. The result was quite satisfactory (and indeed impressive) : SmartDO provided a design that is 20% lighter, with even higher strength. The envelop of the new design was also inside the desired space. Overall speaking, SmartDO has achieved an almost impossible mission of design. The picture below shows how the design evolves from the optimization of SmartDO, with the leftest one the original design, and the rightets one the final design. The contour of the color represents different level of stress. It is interesting to note that, other approaches and methodologies have also been applied to tackle this problem, but only SmartDO provides a satisfactory result. SmartDO optimize the design from the original one (leftest) to the optimal design. The contour of the color represents different level of stress. FEA-Opt Technology Co. Ltd. is an international RD/Consultancy/CAE and Software firm. We provide superior RD/consultancy services to our customers, and customized solutions for each customer's special need.